Scrap Paper Scissors etc. : Hakuna Matata........no worries! How's it going, hope you all had a good weekend? We spent Saturday buying Halloween candy then filling the little goodie bags we hand out. I say 'we' but it really involved me buying the candy and the girls filling the bags.......kept them quiet for a good couple of hours at least! I took them to the Cinema yesterday to see Cloudy With A Chance Of Meatballs 2......not bad - I did manage to stay awake for most of it at least! See.......some would consider it an expensive way to get a catnap, but for those with young children, I know you will agree.....money well spent!! 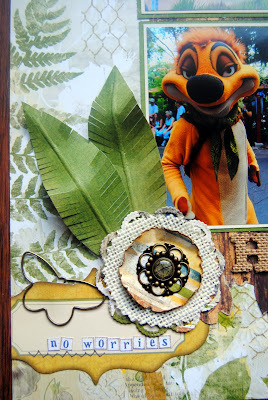 So, on to today's project - a scrapbook page. 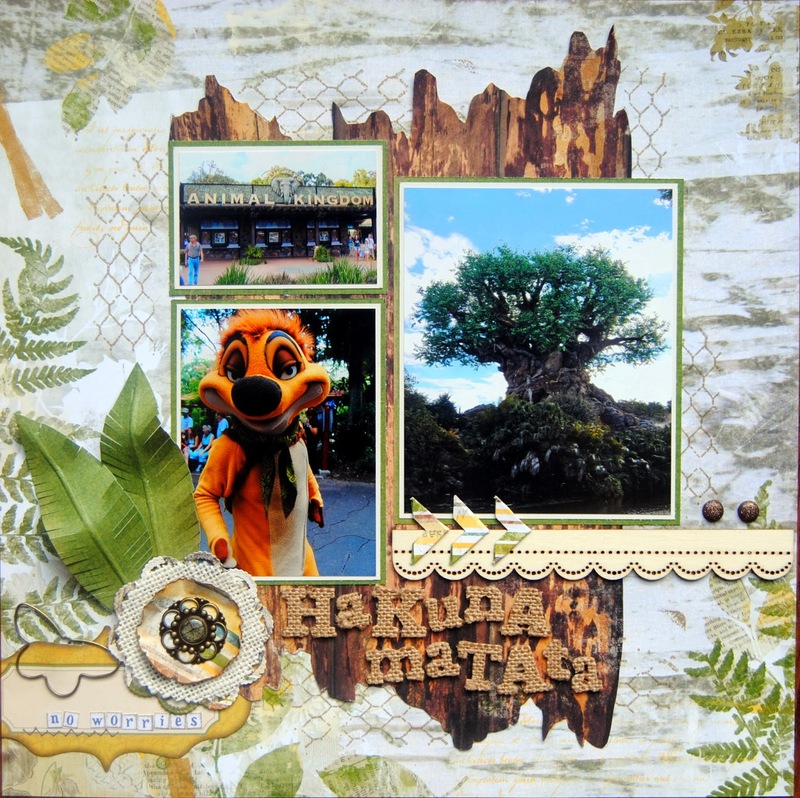 I sort of forgot I hadn't posted this and one other from a DT Kit I received from Two Scrapbook Friends a while back. I think I've completed two since then so time for 'blogging' catch up! This kit was using the 'Trail Mix' collection from Bo Bunny, and although it's something I would not normally choose (or rather, would tend to run a million miles from actually! ), as it's very 'fishy/outdoorsy' orientated........I have two girls.......there is very little (Translate: NONE!) fishing going on in these parts. I do however enjoy the challenge of taking a collection like this and using it for something completely different. 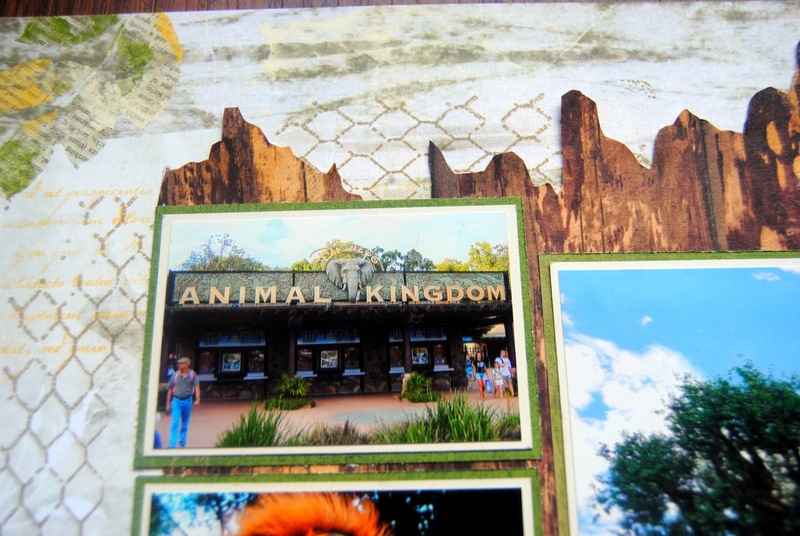 This is only the second 'Disney' page I've scrapped from our trip 2 years ago......I will get that book done some day! I figured that tree bark would work wonderfully with these photo's from the Animal Kingdom, so I randomly cut a piece for the background. There's also a little stamped chicken wire too. I liked the idea of keeping with 'natural' elements so I have some wood on there (you know I like my wood!) and these awesome burlap covered alpha's for the title. 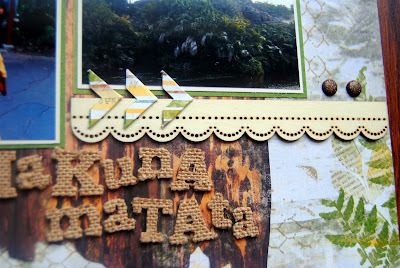 Those chevrons are made using a Martha Stewart 'photo corner' punch.....I find I use it more this way! 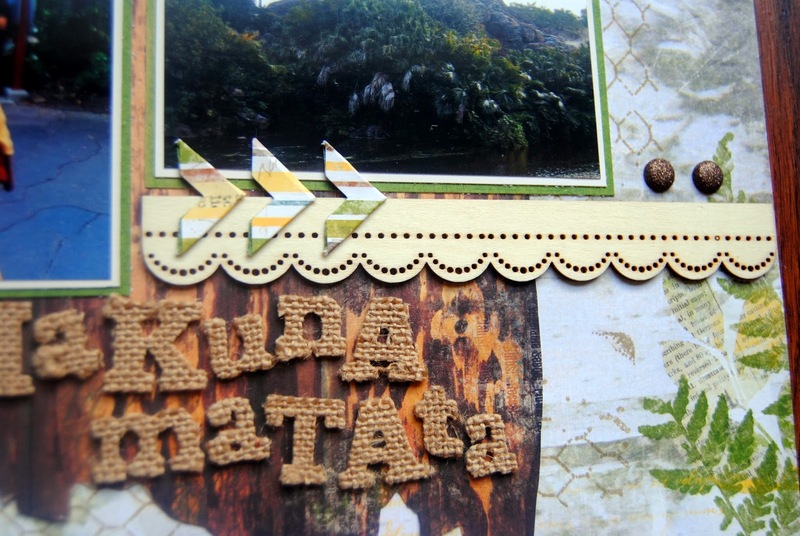 The combination of embellies in the bottom corner consists of a tag fussy cut from one of the sheets of PP, a butterfly paper clip (Maya Road I think), layers of paper die cuts and more burlap topped of with a pretty brad. I hand cut the fern leaves from PP, glued a little florist wire on the back, folded them in half around the wire then snipped diagonally with scissors. The wire gives them a sturdiness that you can then manipulate into whatever shape/position you like.......works great as feathers too if you change up the PP. And that's about all folks! I'm trying to get a little more organized with my blog posts, so the plan is to be back on Wednesday for Little Red Wagon day, then Friday with the second LO from this collection.........we'll see if that works out! If you keep this up, your Disney book will be awesome! Love this out of the box for Jayne look!!! I love the chickenwire background and the hand cut feather Jayne!